…apologies to regular readers for my long absence from post on this blog. I started an ABC role back in October which overlapped with me running the Screen Australia StoryLabs weeks and as well as tidying up and finishing a range of commercial projects meant actually talking/blogging about all the stuff I have been doing in long form, has been tricky – plus there are confidentialities to take into account. The adage certainly holds true those who can, do, those who can’t, write long blog posts or podcasts on the topic 🙂 Might get flamed on that one, but I think having an hour or two to sit and post is a luxury. In other full time roles I still manage to provide a commentary into the cloud but the ABC is particularly under resourced in multi platform areas with many folk working beyond the call of duty. I am also taking advantage of my partner Laurel Papworthaway, spending a few weeks on a pilgrimage across the Camino in Spain, and doing very well with it. Sure everyone is shifting attention to mobile & social but until there is zero people watching our main channels we have a job to do! Rights are not set up for multi platform, period. Expensively produced linear video leads, the rest follows, still. Ok I am being a little provocative and at the ABC, I and many others are very aware of the challenges and getting on with the changes required. Alongside managing producers and resources I am able to run group workshops internally with the key show creatives and together (vs telling what we should be doing!) to slowly move forward. I also have a great role in developing working prototypes (and final services) of synchronous 2nd screen and social mobile services. Being several months into these, I also refer to at the end of my talk of the key differences between vanilla social TV, content owner social TV, content owner driven 2nd screen storytelling and the hybrid of all of them. When someone is engaged with a great synch story experience of say tablet against TV it makes absolute sense to include social elements, for them to invite and share that experience. Good morning and thank you for inviting me to be the first speaker today. I am currently the Exec Producer of TV Multi Platform at ABC, responsible for the non-kids TV sites, social media strategy and implementation and mobile apps. 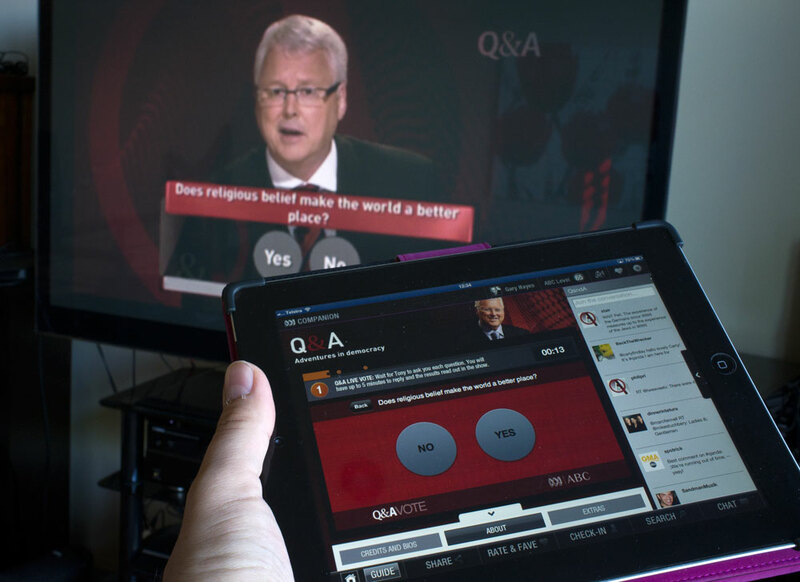 The department also runs iview and all the kids multi platform services as well as trialing new services, such as the live Q&A vote over the past few weeks. I have only been in the role for 7 months so my talk reflects some of the challenges and new service opportunities I see for ABC Multi Platform with fresh eyes. Challenges I think that are relevant to all media organisations in a constantly shifting user landscape. ABC is already a leader in multi platform services but there is a long road ahead and one that requires significant vision to ride out the coming storm. For this reason I called my talk The Hybrid Media Challenge, taming the coming perfect storms – I used the plural of storm as yes, there is are a few ahead. But first a little background history. 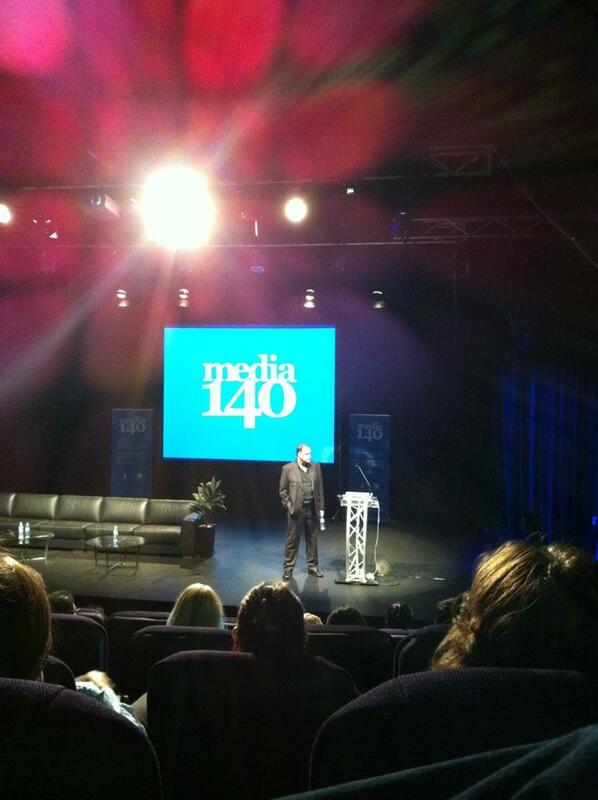 The first time I came to Australia in 2000 was for the Small Screen Big Picture conference round the corner in Freo. I was over here keynoting about BBC Interactive TV, as Senior Development Producer, and how red button, one way interaction was transforming TV. Today I want to continue some of that presentation, but first a little something I presented on the final panel of that conference – what the world would be like in 2009 as seen from 2000. You can see that slide from 12 years ago here – apologise for the text blitz… Surprisingly, I looked at this last week, nine of these ten predictions are pretty spot on and four form the foundation for my brief talk. Seriously using old content! Everything can be made portable and kept forever. Everything is available on-demand from anywhere over vast broadband networks. Everything is pulled & only personally relevant content is ‘pushed’. Force 3 – Mobile – The personal portable portal. Our always on, private windows to the world. I will get onto the Hybrid Media focus of the talk in a moment and how combinations of the above help us steer through the confusion. We need to ask ourselves, in the coming stormy digital environment should we hide or try to control and tame it? The ABC has been at the forefront of mainstream multi platform over the last two decades and continues to do so. Here are a few services we have launched over the past couple of months while I have been there such as traditional popular TV web sites such as Miss Fisher, The Straits and the Time Travellers Guide to Australia. Alongside this we have a range of highly social media friendly programs coming up such as Randling, Opening Shots, Life as a Playlist and many kids services. Previous 2009-11 services that got widespread recognition and incorporated community content or personal exploration included Making Australia Happy (which had 30 thousand take the test), Gruen Transfer, Angry Boys (amazing social engagement) and Wide Open Road. But the environment that these services existed in has changed rapidly so you and I, as content makers, need to be prepared. What are the big changes? Firstly we are seeing a massive growth in the proportion of mobile accesses of ABC Online content. Growing at almost a percentage a month and now currently at 18% of all online visits. If we look at engagement or time spent we may be looking at early 2013 as a point where more time is spent with ABC online on mobile than PC. The recent launch of the Good Game app for instance. There was a simple submit your review feature in the app. In the past year via the website 500 reviews were submitted, in the first week of the apps launch more than 31000 reviews were sent in via mobile. Also iview is seeing massive increases in mobile views and we predict that in 2013 the viewing will be higher on mobile than on TV too. But with the increase in mobile access there is the decline in general viewers of broadcast TV content and the shift to on-demand or catch-up. I won’t reveal Australian stats so lets look at the recent fall in ratings from our cousins over in the US. Sunday’s New York Times reports that during March compared with this time last year Fox lost 20% of its viewers, NBC 3%, CBS 8% and ABC 21%. Then there is the issue of social media. Users so busy sharing their own stories to care about the ‘curated’ ones. As I was the one who created this widget I hope you will forgive me displaying it once more. Two simple things to draw from this – online content is now becoming as trusted if not more so than traditional media, but the tsunami of community created content is accelerating faster than traditional media output who are resorting to repetitive or repackaged, unsurprising, irrelevant content. How will that work out? It is critical to have a vision in this altered landscape, without it you will always get lost in a jungle that is sprouting new plants at every turn. If you do not know where you are headed in this constantly changing world you will find yourself going around in circles and/or simply disappearing for good. Continuing this plant metaphor, content needs to remove its single platform roots and be accessible everywhere. Transmedia is a term we don’t use a lot in the ABC as it is not specific or focused enough but the principle behind it is simple. Transmedia is about keeping users engaged in your story as they move across their media & life platforms and channels on one or multiple platforms or devices. Build connections According to Oztam in Q4 2011 Australia we have a tipping point mix of platforms – DTT at 95%, PVRs at 44% Mobile 49% Internet enabled households at 77% tablets 10% and rising quickly. But media is no longer a single ‘push’ island, controlled and fenced in – scarcity is a thing of the past. The landscape has splintered, fragmented and all organisations need strategies to produce content that can travel. I often call it transocialmedia, because the ‘packaged’ stories are in many cases transported or referenced by social networks. Many broadcast shows are well crafted video stories by those who have big budgets to create high production value linear content. But producing stories across platforms is still very difficult because funding and commissioning in 99% of cases still given to those who have a track record in single platform storytelling. This needs to change if it is to remain relevant. I was going to talk more about one area on this map in the bottom left called the Straits of Augmented Reality but time is pressing. But be prepared for the slow layering of the digital over the analog, our physical space. 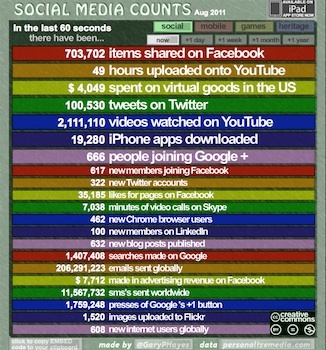 Think about each of these ‘social’ services being layered and mapped across our real world. What are the implications, the opportunities? High production value, geo located content is certainly new and is actually one of the few areas where normal users are ahead of the ‘professional’ creators. Everything humanity has created can potentially be geo located but more than that new hybrid forms will organically emerge. New forms of storytelling for example Miss Fisher’s Murder Mysteries could be delivered as video, audio or mini games across physical Melbourne Streets on smartphones or tablets, you follow the trail and experience the real environments. Finally I want to get onto a key Hybrid Media Form from ABC perspective – Social TV and Second Screen. Two of the most powerful media forces at the moment still. 1 – Live broadcast event TV and 2 – social media. The conversations that occur against one off events, live shows, reality TV etc: are without doubt with us forever and compelling for many. 280 million for example share TV shows on their Facebook profiles and TV dominates twitter worldwide. Social and TV are compelling bedfellows. 85% of TV watching in the US is with a connected device, mostly mobile or tablet. There are many vanilla Social Program Guide services springing up globally, I have about 30 on my iPad and Android tablet at the moment, and we are still very early days. Most have no connection editorially to the shows, which is where the creators of content have a clear advantage. The appetite may not be fully developed yet in the audience, but content owners are laying the foundations for hybrid mixes of synchronised 2nd screen, deep social sharing and stickiness. This leads back to the start of my talk. Interactive TV 1.0 that was red button, user against the set top box. A rather one way, cold experience. But even then, when the editorial was right, such as some early services I helped make like Test the Nation or Walking with Beasts, the interactive users reached 8/9 million per show. But now we are in an evolved second screen world, the social layer combined with play-along apps and finally a robust way for users to communicate back, in real time, to the creators of the shows. The ABC and other broadcasters have a great opportunity now in creating the ultimate Hybrid Media Format. Personal Mobile alongside Live TV – a perfect storm and a marriage made in media heaven. 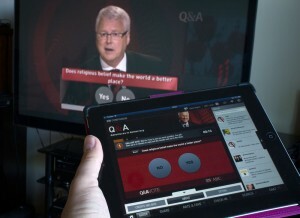 We are trialing services like the recent Q&A vote to start to test the appetite for real time interaction. Q&A of course is already well known for the parallel twitter feeds around and into the show, but we are looking at synchronized services across the board, especially kids services. Compelling 2nd screen storytelling interaction that will potentially bring users back to appointment to view, broadcast – because simply, there is something to do. I am also developing in the Multi Platform team, something we are calling the ABC companion app. What you see here is a very early prototype which is evolving quickly and it combines a range of features that we see are important to meld together in one service. Features such as recommendations from friends and AI agents, social share, 2 screen synch elements such as vote, play, extras, some gamification elements, integrated on-demand and catch-up, remote control and much more. Admittedly there are other services that provide some of this but it really starts to come into its own when the content creators are involved and can really link social features with editorial content. Thanks for posting such an interesting blog article. This useful combination of mobile, technology and media is surely going to give good results. Even ABC is moving in such modern directions with time. Media is changing and developing everyday . and due to this fact the world has become a much know place to all .and to see more of this change would be a great feelings for us ..
Nice post! I pretty much enjoyed the whole article. What is the hardest part for you? Anyway, thank you very much for sharing it to everybody. You have proven again that we need to evolve in order to adapt to the ever-changing landscape in the world of media and online community. Thanks so much for this very detailed aticle on how ABC have adapt to these changes. Really inspiring! Awesome! Its really remarkable article, I have got much clear idea concerning from this piece of writing. Hi there! This is the kind of info that are supposed to be shared around the net.